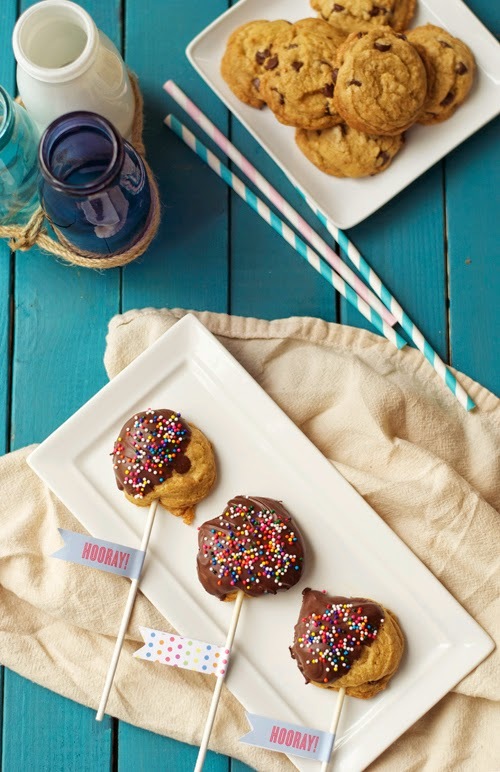 Leanne bakes: Chocolate Dipped Cookie Pops... with sprinkles! Know what I love about these cookies? I love how they eliminate the problem of not being able to cram enough chocolate into the cookies. I love how easy they are to dip into milk. And I love how they leave little rainbow milk trails in your glass. I love how they're equally fun for the adults in our house as they are for the kids. I love how cheerful they are, and how they remind me of a circus, or the crazy fun birthday parties you had as kids where your hands were always sticky from icing and cake. And I love, maybe most of all, how they're the perfect snack to cuddle up with, as a family, as we wind down from the day before heading to bed. If you are feeling organized, meticulous, and/or up to cleaning extra bowls, mix together the dry ingredients (flour, baking soda, salt) in a medium bowl. If you are none of these things (me), don’t both and skip to the next step. In the bowl of a stand mixer (or using a large bowl and a wooden spoon/hand mixer. Whatever gets the job done; these are cookies, not a soufflé for the Queen) cream the butter and sugars. Once the mixture is appropriately mixed and reasonably light in colour, add the egg, egg yolk, and vanilla. Mixmixmix until it turns a slightly lighter colour, you don’t see egg-y streaks, or you run out of patience; whichever comes first will do. If you pre-mixed the dry ingredients -- bravo! -- you can add these to the wet ingredients now. Mix them until everything is nicely, but not overly, combined. If you did not pre-mix, add your baking soda and salt, and give it a quick mix to ensure they get dispersed nicely. Then add the and flour. Mix until things are well combined, but don't beat the crap out of it. Stir in 1 1/2 to 2 cups of the chocolate chips then chill the dough for about an hour. When ready, preheat the oven to 325F and line two baking sheets with a silpat mat or parchment. Using a 1-inch cookie scoop, drop spoonfuls of the dough onto the cookie sheets. Insert the lollipop sticks into the centre, and bake for 8-12 minutes. Cool on a wire rack. To make the chocolate for cookie dipping, heat the chocolate on half-power in the microwave (or in a double boiler). Stir in the butter until smooth. 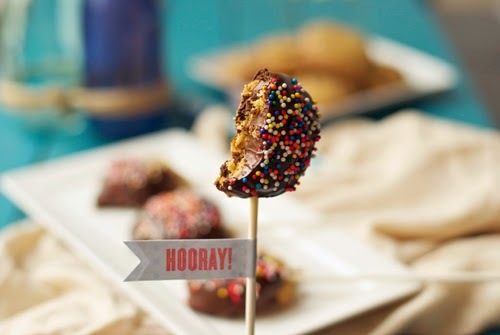 Dip either the whole cooled cookie or one half in the chocolate and sprinkle with sprinkles. Eat right away or let harden!